(ASCA): Rome, 14 Feb: The commission appointed by Pope Benedict XVI to evaluate the authenticity of the alleged Marian apparitions at Medjugorje, led by Cardinal Camillo Ruini, is expected to present its concluding report before the end of 2012. Cardinal Puljic’s last announcement may be as puzzling now, as a few others have been in the past decade. However, there is certainly one declaration that has been unequivocally important and factual. VATICAN CITY (CNS) — Cardinal Vinko Puljic of Sarajevo, Bosnia-Herzegovina, announced a commission would be formed to review the alleged Marian apparitions at Medjugorje and pastoral provisions for the thousands of pilgrims who visit the town each year. “The commission members have not been named yet,” Cardinal Puljic told Catholic News Service in a July 24 telephone interview. “I am awaiting suggestions from the Congregation for the Doctrine of the Faith” on theologians to appoint. “But this commission will be under the (Bosnian) bishops’ conference” as is the usual practice with alleged apparitions, he said. Cardinal Puljic announced the future formation of the commission during the bishops’ July 12-14 meeting in Banja Luka. The Vatican continues to monitor events at Medjugorje, where the apparitions allegedly continue, but it has not taken a formal position other than to support the bishops’ ban on official pilgrimages. An official of the Congregation for the Doctrine of the Faith confirmed July 25 that the commission would operate under the auspices of the Bosnian bishops’ conference, although the congregation would suggest the names of some commission members. Apparently, the CDF put a stop on that “initiative”, first presented at the BiH Bishops’ Conference in Banja Luka, that delayed for almost four years the creation of a new commission. Why? Sarajevo, Bosnia and Herzegovina, Nov 20, 2009 / 11:45 am (CNA). 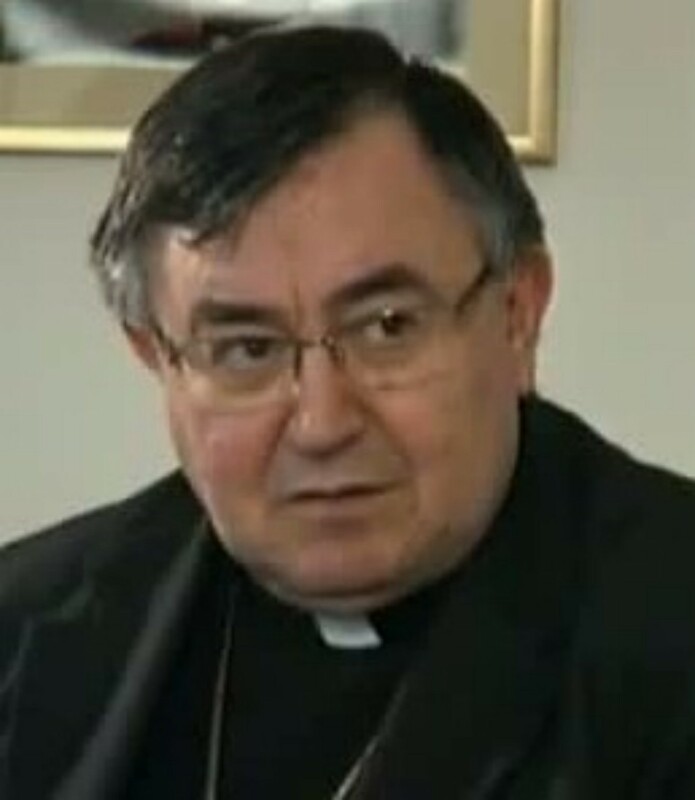 Cardinal Vinko Puljic, Archbishop of Sarajevo and President of the Bishops’ Conference of Bosnia and Herzegovina denied press reports yesterday which claim that the Vatican is creating a commission to investigate the alleged apparitions of Medjugorje. The cardinal, who is visiting Rome to attend the plenary session of the Congregation for the Evangelization of Peoples, of which he is a member, said that the Congregation for the Doctrine of the Faith is neither preparing a document nor establishing a special commission to study the Medjugorje apparitions. Cardinal Puljic said that the official position of the bishops of Bosnia and Herzegovina is the one expressed by the then Bishops’ Conference of Yugoslavia in April 1991. “The doctrinal issue of the Medjugorje phenomenon is resolved, but its pastoral significance must still be taken into account,” the cardinal continued. “The Medjugorje phenomenon is not only gathering faithful from Bosnia, but from all over the world, and in places where people gather to pray, God gives his blessing. Therefore, we should carefully examine all sides of this phenomenon,” he added. 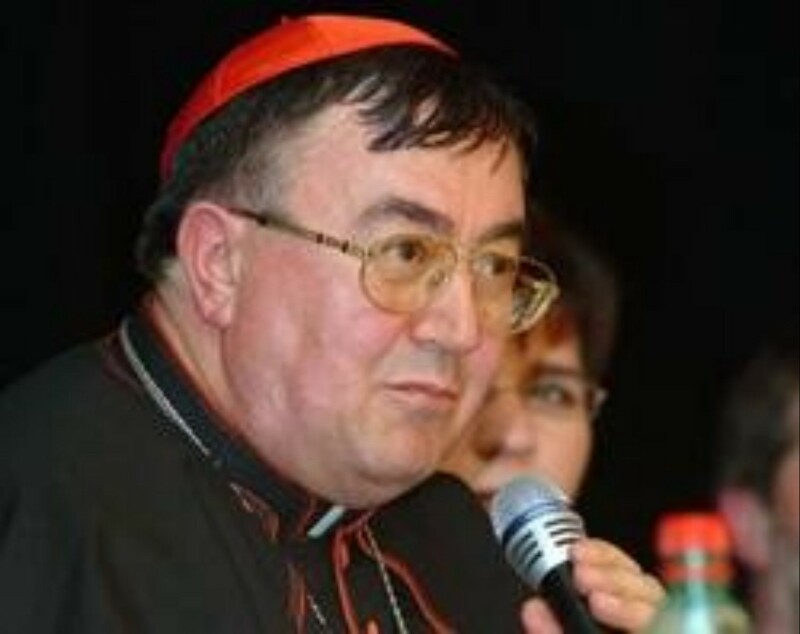 According to Cardinal Vinko Puljic, still President of the BiH Bishops’ Conference in 2009, the CDF is “neither preparing a document nor establishing a special commission to study the Medjugorje apparitions,” as he seemed to hope six weeks earlier. Is it not puzzling that the head of the Bishop’s Conference concerned by the Medjugorje case does not “appear to know” in advance that the establishment of a special commission will be announced four months later? Why? It seemed, at that time, that the CDF wanted to proceed “its own way”, without having the “local bishops” in control of, at least, the “communiqués”. 17. 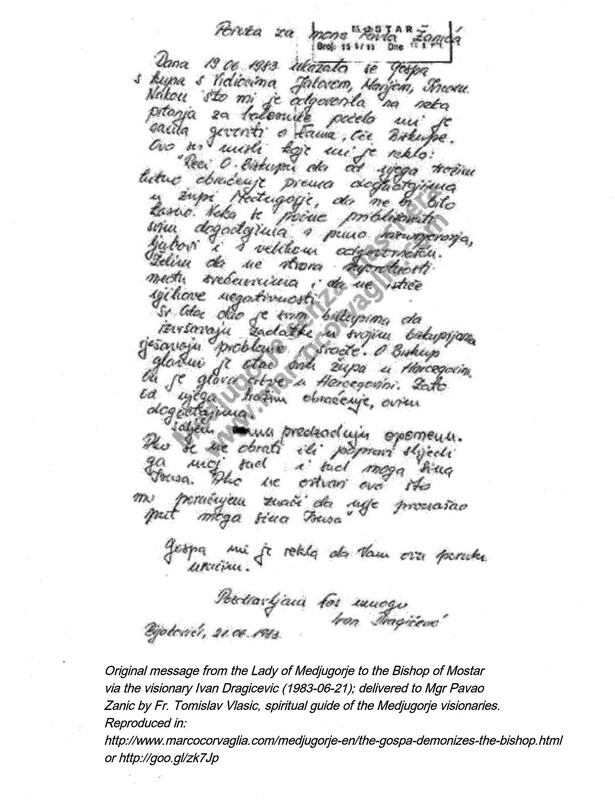 “Tell the bishop that I seek a quick conversion from him towards the happenings in Medjugorje before it’s too late. May he accept these events with plenty of love, understanding and great responsibility. I want him to avoid creating conflicts between priests and to stop publicizing their negative behaviors. The Holy Father has given all bishops the duty to fulfill certain tasks in their respective dioceses. Among these, bishops are to solve problems and arguments. The bishop is the spiritual father of all the parishes in Herzegovina. Our Lady told me to give you this message. Rev. Tomislav Vlasic brought this document to me, which he more than likely wrote himself in a moment of exaltation. The said leader has been the éminence grise of the Lady of Medjugorje and the visionaries’ inspirer, the main protagonist of a “serious threat for the Church and for her organizational and doctrinal unity”. Let us guess that that particular state of things did not and does not escape the vigilance and discernment of the Archbishop Cardinal of Sarajevo and of the experts of the Commission. More great work here, Louis. Thank you. I take particular interest in the comments back and forth with Diane and Mark, too…and the newly published “Central Nucleus” information from Marco Corvaglia is astonishing. Thank you so much for pointing out that interesting thing Marco added. I am flabbergasted. What can I say? – Benedict XVI initiated through the CDF (2008) the sanctioning of Fr. Tomislav Vlasic who has since become a “free electron” — what Mgr Zanic saw and foresaw — under the magnetic attraction of a “Central Nucleus”. Please read the important article published in English yesterday by our friend Marco Corvaglia. – In some posts, I insist calling Benedict XVI to witness for his aspiration for truth. I also agree with you that according to our own knowledge of the dossier, there is ample evidence for a “constat de non supernaturalitate” — a change of status — and last but not least, there is a legitimate opportunity for Benedict XVI to submit a kind of motu proprio (medjuproprio?…), in refreshing the 1978 Norms and making them public. In short, we are dying for a vade-mecum — coming from the highest authority — on the pastoral care of intelligence applied to the so-called private revelations. That does sound interesting – the letters you mention. Please do follow-up with that. With regards to the “Vaticanese atmospheric pressure” (great expression, btw), I have so much more confidence that Pope Benedict will not yield to that. He didn’t with Maciel. I know you have concerns over what he wrote in the Ratzinger Report about ancient pilgrimage sites; but, I also consider the fact that it was spoken so soon after the beginning of the apparitions. What he knew then and what he knows in 2012 is very different. I believe he sees the division it is causing, and nothing but the truth will end those divisions. 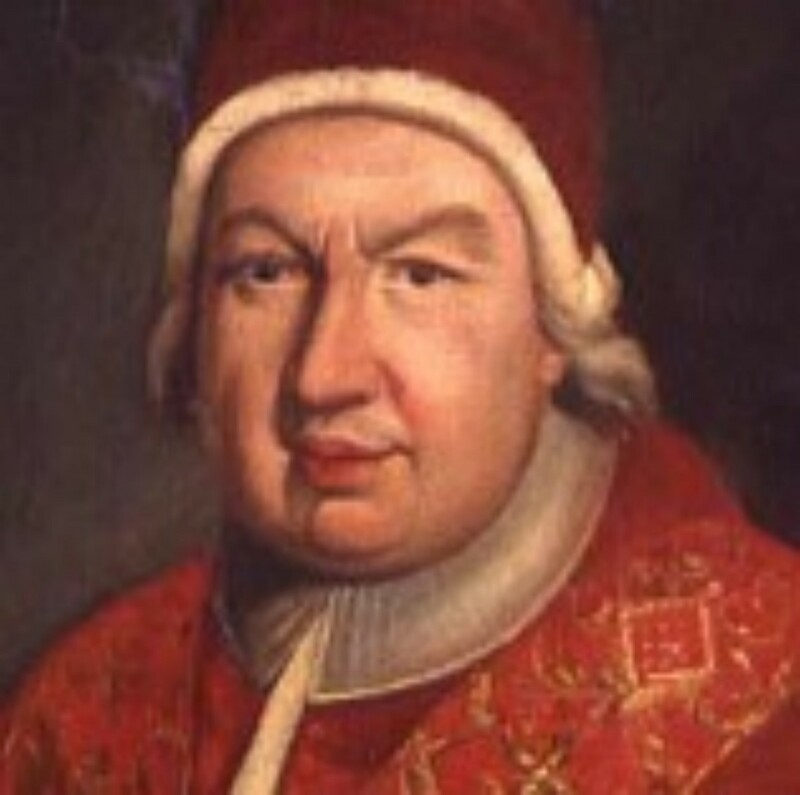 My personal belief is that we will see a negative judgment – a “constat de non…” My reasoning, besides an objective view of events – especially from the early days – is that it cannot be affirmed as supernatural while ongoing, but it can be condemned while ongoing. Affirmation would wait until cessation of visions. For those who have not yet pondered it, consider how the Church would be scandalized if an apparition was approved one day, then stated there were four persons in the Trinity the next; the Church would lose credibility. Right now, the “non constat…” has left so much room for manipulation. Pope Benedict has stated, through the Apostolic Nuncio in BiH that he felt responsible to make a clear message. Would he go through all of this, only to re-affirm the 1991 Zadar Declaration? I do not believe so. The CDF could have issued pastoral guidelines. What I am uncertain about is what he will do about the larger, pastoral issue – millions who are attached – even born into this within the past 30 years. In the past, any apparition condemned as “not supernatural” often resulted in restrictions on gathering at the site. I also trust the Holy Father on one other level based on what he did with Maciel. He had to know the severe fallout that would happen within the Legionaries of Christ. They are now fighting for their survival. He did not go out of his way to allow them to save face. While Medjugorje involves millions, if not tens of millions of people, it is not as complex as having a religious order in need of being reinvented or dissolved. In other words, Pope Benedict XVI did what he needed to do, and let the chips fall where they may. I believe he will do that with Medjugorje, but not without a great deal of compassionate catechesis, followed by more clear and helpful guidelines for bishops. In any event, I’ll re-iterate, I can’t envision going through all of this only to reaffirm the, “non-constat…” especially if the Holy See has evidence that it is not authentic. I personally believe a change in status is coming. My perception is less that Card. Vinko Puljic is “inconstant” — it surely looks “as if” — but more that he is submitted, like some of his colleagues from Bosnia-Herzegovina, to a certain “Vaticanese atmospheric pressure”. My impression is also — for what it’s worth — that if the higher authorities had let the local authorities*** (diocesan and national) solve the “problem” in due time (more than 20 years ago – before the war – or even in the second half of the 90’s), they would not have that hot potato to manipulate, still in 2012. Benedict XIV (Prospero Lambertini) had shown the way. You are right, dear friend Louis, the declarations of Card. Puljic are not always very clear. For me there is no doubt that Rome will reject the ‘apparitions’ in Medjugorje. But the exact wordings of the rejection will be extremely delicate, because so many have been fooled by the innumerable manipulations. Thanks, Diane, for your precision and referencing. I have reread a letter from the former Minister general of the O.F.M. (John Vaughn – the first American to have been elected to that post – 1979-1991) dated 1981-12-11 to the Ministers of the Order and to all the Friars concerning the province of Herzegovina. It’s 1½ page. I think I should write an article about that letter and another very long one dated 1989-02-22. Excellent summary of these communications, Louis. I have added a link to the bottom of my post. I would also point out for readers that the situation with the Franciscans is really a dispute between them, and the Holy See. So many people have heard about the “rift between the bishop and the Franciscans”. A reading of the Holy See decree at the root of the so-called “rift” reveals that the bishop was merely trying to bring that territory out of missionary status by putting diocesan priests into a few parishes. The Holy See generously allowed the Franciscans to keep about 50% of the parishes – a situation we do not see in any settled area of the world. Typically, when large numbers of Franciscans run parishes, we are looking at missionary territory. Bosnia-Herzegovina is well beyond that.